Tyler was excited about his first day at school. So excited in fact, that only a few minutes after class started, he realized that he desperately needed to go to the bathroom. So, Tyler raised his hand politely to ask if he could be excused. Five minutes later Tyler returned, looking more desperate and embarrassed. "I can't find it," he admitted. The teacher sat Tyler down and drew him a little diagram to where he should go and asked him if he will be able to find it now. Tyler looked at the diagram, said "yes" and goes on his way. Well, five minutes later he returned to the class room and says to the teacher, "I can't find it." 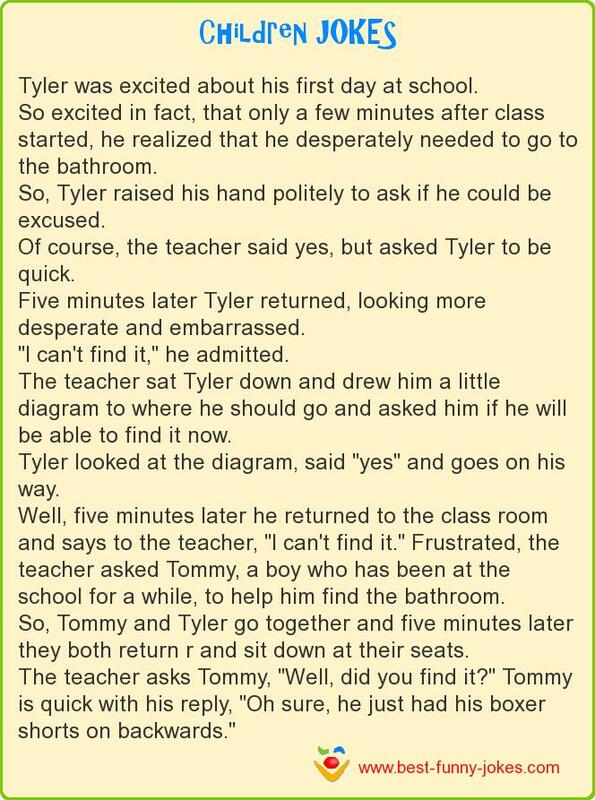 Frustrated, the teacher asked Tommy, a boy who has been at the school for a while, to help him find the bathroom. So, Tommy and Tyler go together and five minutes later they both return r and sit down at their seats. The teacher asks Tommy, "Well, did you find it?" Tommy is quick with his reply, "Oh sure, he just had his boxer shorts on backwards."